A Great Place to Live and Play! The CARDINAL is published and distributed quarterly. Businesses are encouraged to advertise in the CARDINAL and WB residents are encouraged to support those businesses. Email info@walnutbendno.org to send your ad and/or to get more information. Payments can be mailed to: WBCA, P.O. Box 740022, New Orleans, LA 70174 or purchased via PayPal below. One free issue of advertisement is given to those who pay for yearly publication. 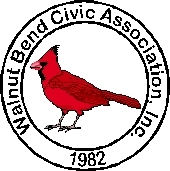 An additional 10% discount is given to Walnut Bend residents who pay for yearly advertising. Content Copyright 2011 Walnut Bend Civic Association. All rights reserved.